I'm excited to share with you the food from my daughter's second birthday. I love themes and she greatly treasures books, so I used Dr Seuss. There were plenty of ideas on Pinterest. I wanted to keep it a little healthy with no pop or chips. I did all the decorations ahead of time, which my daughter found exciting. She kept saying "Wow!" at the balloons and banners. 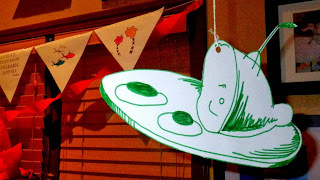 I loved when she looked at my Green Eggs and Ham cut out and declared, "I do not like Green Eggs and Ham!" "I do not like Green Eggs and Ham!" The Grinch Who Stole Christmas-- Grinch Smoothie. Spinach, banana, yogurt, and milk. It was a hit! My Dr Seuss food table. Like my homemade cupcake stand? Horton Hears A Who-- Horton's snack tray. Elephants love vegetables. And there is Grinch Dip in the back. Hop on Pop -- For my label with the buns and spreads, they have a picnic with Mr Brown and Mr Black. The Grinch Who Stole Christmas-- The Roast Beast. Green Eggs and Ham-- Minus the fancy labels. Fox in Socks-- Three Cheese Trees. I saw lots of hanging or tooth-picking ideas, but towers worked (briefly). The Lorax-- Thank you to a friend for bringing the Truffula Fruit. Yertle the Turtle-- I went to buy blueberries and there wasn't any. Chocolate covered it was! And to the right is my Cat in the Hat banana and strawberry skewers that I didn't get pictured. Cat in the Hat-- Red Velvet cupcakes (made with beets) with blue icing for Thing One and Thing Two. The Lorax-- Truffula seeds (raisins). Horton Hears a Who-- The elephant's peanuts. And that is my collection of Dr Seuss birthday pictures. There were 10 children. We had a great time, with coloring, crafts, a book walk, and we watched The Lorax with popcorn (Hop on Pop-corn). By the way, my popcorn maker didn't work so I just microwaved the seeds plain in paper bags. Success! In the end it was a very happy birthday. My birthday girl received many new books that we have already read over and over and over. I look forward to the next party.